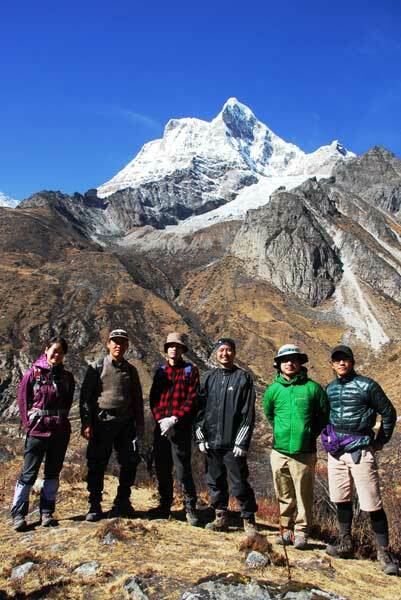 I conducted field work, including trekking for10 days and 9 nights in mountain side in Bhutan, on natural environment, human living environment, and environmental education. The main research activities were as follows: 1) Taking photos which could be compared to visual documents in 1958 and 1985: Before visiting Bhutan, I obtained some visual documents taken by Prof. Nakao in 1958 and by Kyoto-U climbing team in 1985. In order to see the change in natural environment and life style in this half century, I visited the sites as many as possible and took photos from the same angles. 2) Research for prices of items: living environment can be considered to change drastically along with infrastructure development and inter-village interaction and trading. I collected price data of items and food in Punakha, where road had been opened in 1985, in Gasa, where we can have access by car now but not yet in 1985, and in Laya, where we still have to walk to reach. 3) Collecting documents for research on environmental education: I obtained annual reports, environmental education manuals, and a book "Buddhism and the Environment" published by Royal Society for Protection of Nature. I will investigate the contents of their activity, environmental education, and its change in recent years. Follow the same route with 1985's expedition to Masagang, 9 nights 10 days trekking.